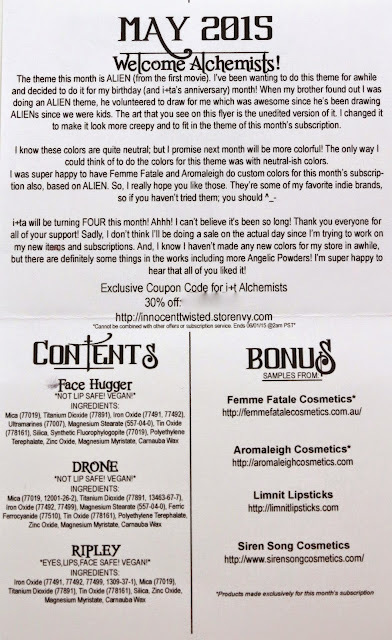 This month's Innocent+Twisted Alchemy subscription was inspired by the movie Alien, and had quite a few extras I was excited about! It's also I+TA's 4th anniversary! 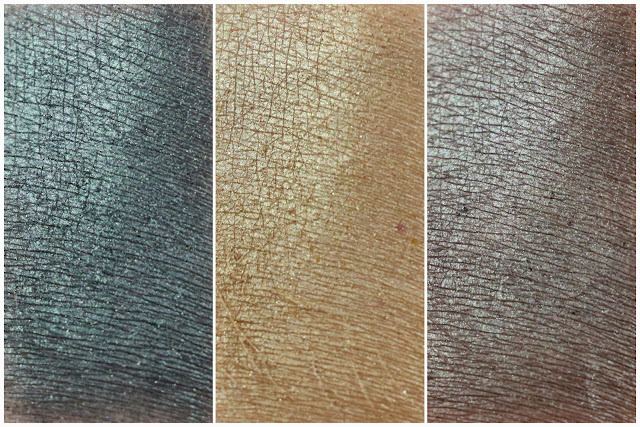 This month's colors were all pretty neutral, but Linda has promised more colors next month. Shipping - My subscription shipped 15 days after I was billed, and arrived in 2 days via USPS from within California. Product Size - I subscribe to the mini subscription, so my eyeshadows are minis. Free Samples - There were four free samples with this month's subscription, two of which were exclusive to the sub. This is kind of a dark brown with a dark teal shimmer. I did notice that the shadows were blended much better this month, so kudos to Linda for working on that after I mentioned it last month. This is a light yellow gold with a gold sheen. It's the only light shade we received, and while I don't mind neutrals, I like a good variety of light, mid-tone, to dark shades. 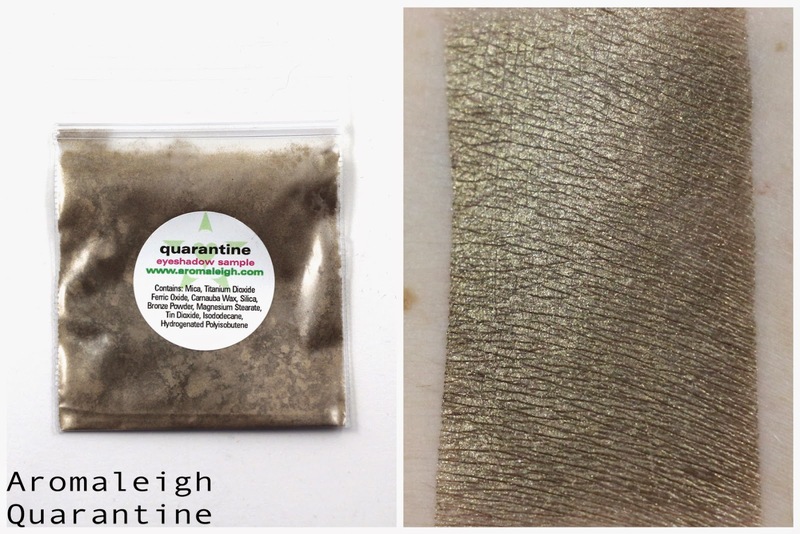 This is a dark brown with a greenish silver sheen. I think it would look good paired with Face Hugger. This shade is exclusive to the subscription, and I really like it. It's kind of a washed out brown with gold shimmer. 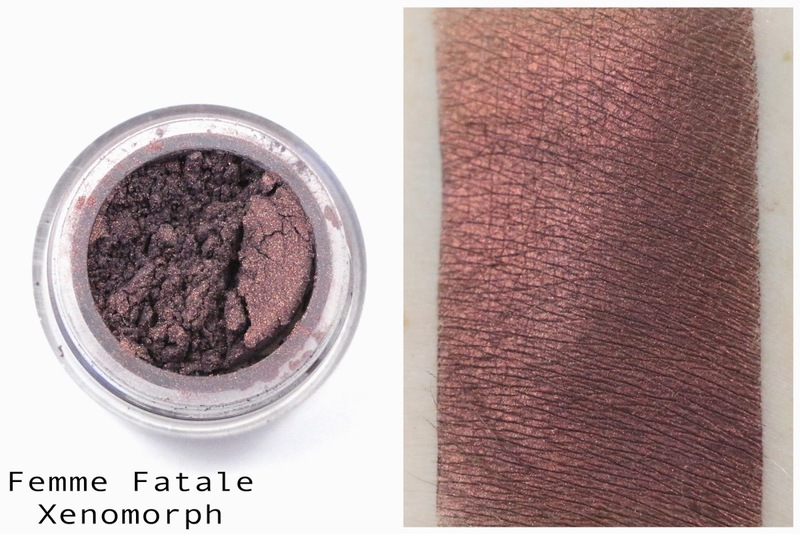 Femme Fatale can do a duochrome like no other, and this one is a dark purple with a red orange duochrome. 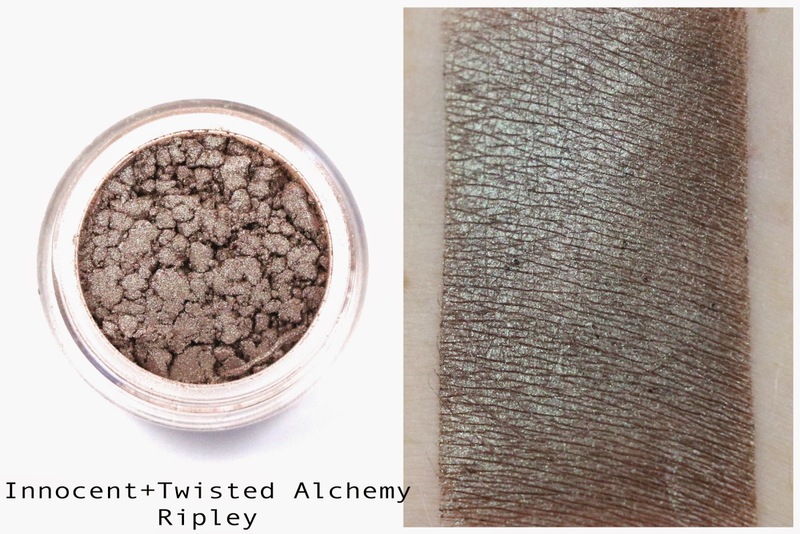 While I love the look of this in a swatch, I just know it will probably look best as a liner. Anything else and the duochrome won't show up. But I can't wait to try it out to see if I can still see the effect. 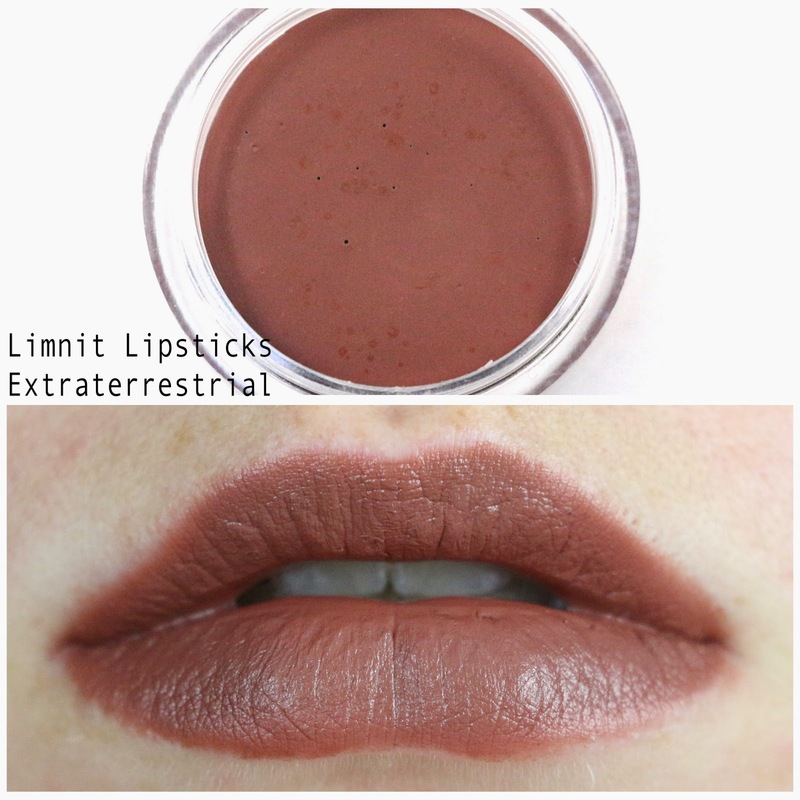 Limnit Lipsticks Extraterrestrial - "Warm-toned brown"
The description is exactly how I would describe this shade, and sadly it's too brown and too warm toned to look good on me. 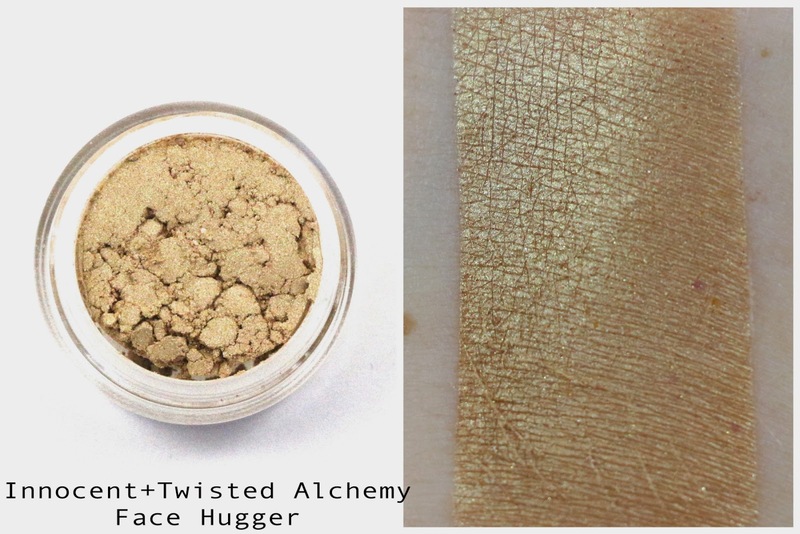 It might be a nice blending shade though to mix with other lip colors. 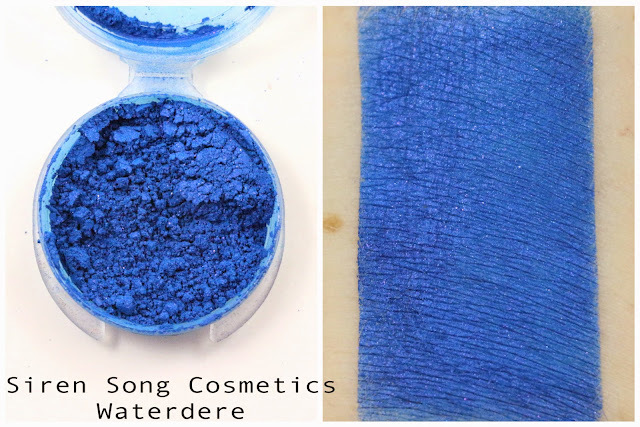 Siren Song Cosmetics Waterdere - "A vibrant blue with violet sparkle you could just... dive into." I think this is the right shade, I forgot to write down which color I had. 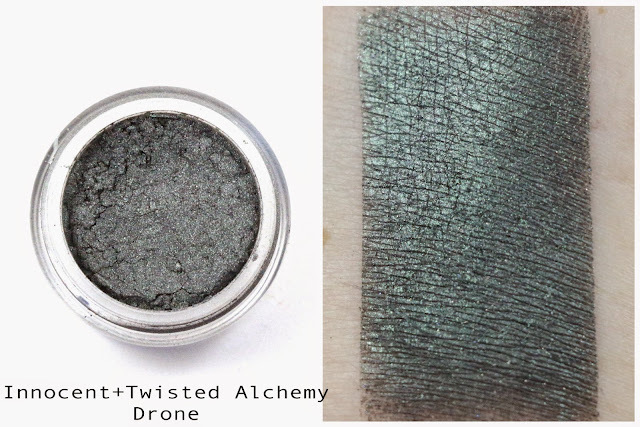 It looks like everyone received a random sample from Siren Song, which was nice because I had yet to try this brand. This shade is a bright blue, almost matte. It stained quite a bit, so it's probably not something I'll use much. Overall, I thought the shadows this month were all great neutrals, and I was glad to see some extras from brands I like. But almost everything this month felt really dark and kind of similar. And unfortunately the lip shade probably won't work for me and my skin tone. My favorites were probably Quarantine and Xenomorph, and I'm looking forward to a more colorful month for June. Overall Satisfaction - My favorites were Quarantine and Xenomorph. This month wasn't really my thing, but I do appreciate the neutrals as I tend to use those a lot.